This week we drove down just before dusk and saw a few bats hovering in the air. It seems very late for them to still be hanging around. I keep forgetting to check in our bat house to see if there are any left in there. This was a hunting week, so we didn’t do any walking on top where we might be in the way of people hunting on the surrounding land. Mike had mowed a new path in 3 Finger Valley for us, and it was fun to try it out. It takes us to some parts of the prairie that I haven’t seen in a year. 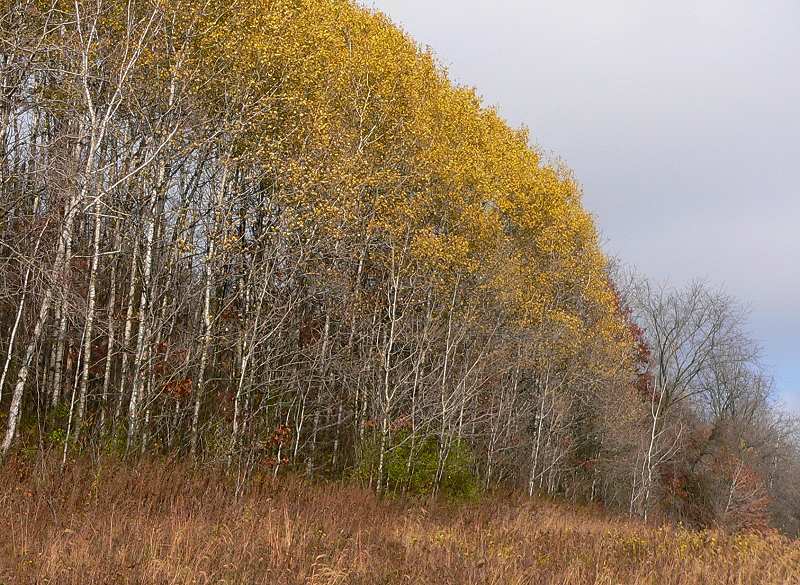 This is a clone of Trembling Aspen that I’ll have to get rid of – there are dozens of baby aspens coming up in the edge of the prairie. Here’s a view looking south from the middle finger of 3 Finger Valley. 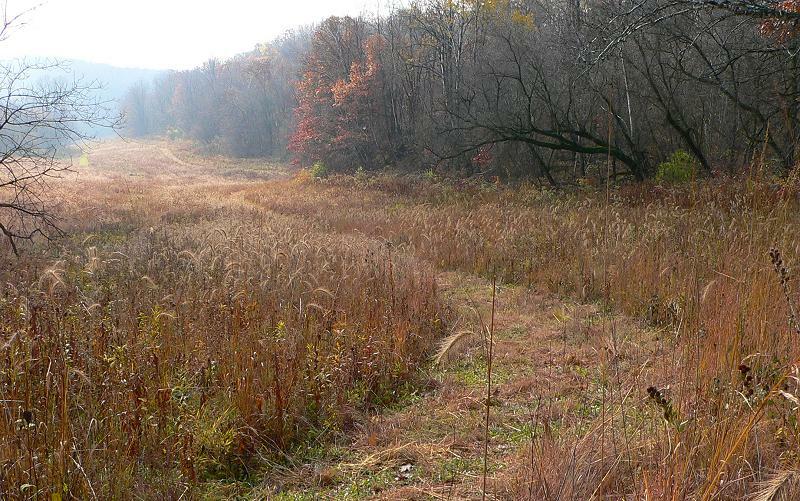 3 Finger Valley is a 4 year old prairie now, and it has areas that are looking very prairie-like. I found lots of Prairie Dropseed – one of my favorite prairie grasses. It has thin, very green leaves that grow in thick clumps in dry prairies, or in the drier parts of mesic prairies. I’ve been planting the seeds in all our prairie plantings, but this was the first time I’ve found any of the plants. Now that I’ve noticed it, I’ve seen it growing in several other places too – I even found one plant that flowered this year. Here’s a clump of Prairie Dropseed with White Wild Indigo and Little Bluestem. 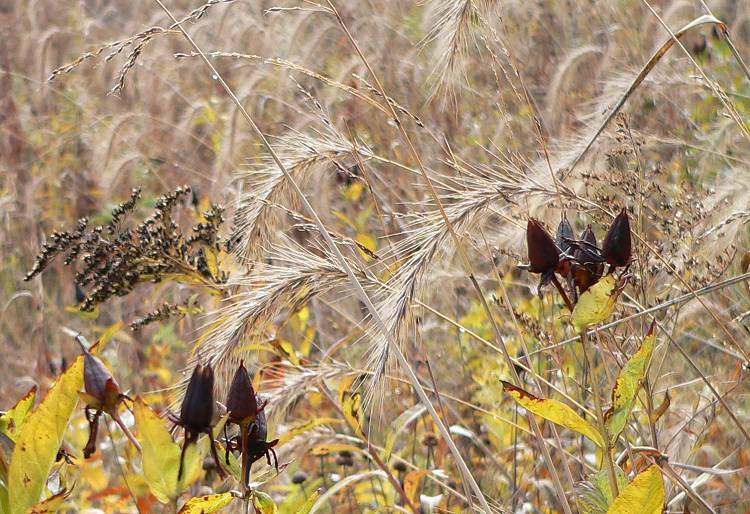 I love the different textures of the prairie plants at this time of year. 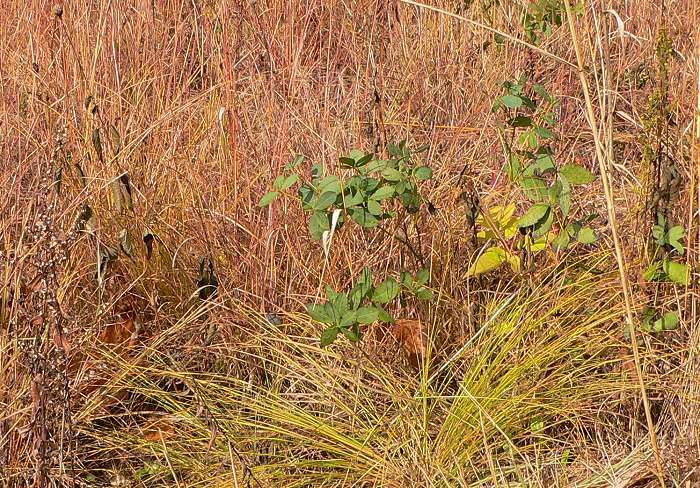 In this picture you can see Canada Goldenrod, Indian Grass, Wild Rye, Monarda, and Giant St. John’s Wort. I was walking in the narrowest part of 3 Finger Valley when a Bald Eagle flew around the corner and up the valley toward me. It was flying low, just above the upper path, so it flew by about 20 yards from me – the closest I’ve ever been to an eagle in the wild. There are still a few butterflies, even on cool cloudy days. 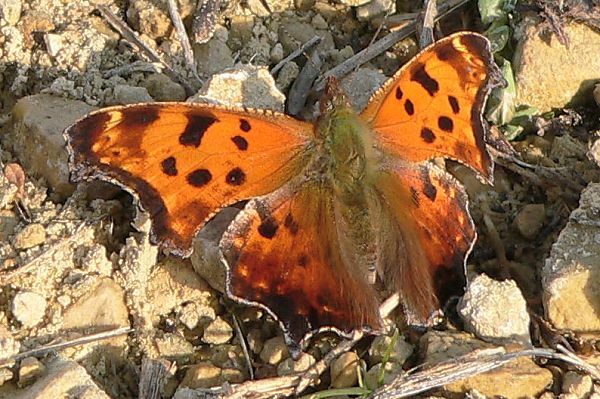 There was an article in the Summer 2005 issue of the magazine American Butterflies about eye color in butterflies, with wonderful photos of butterfly eyes. 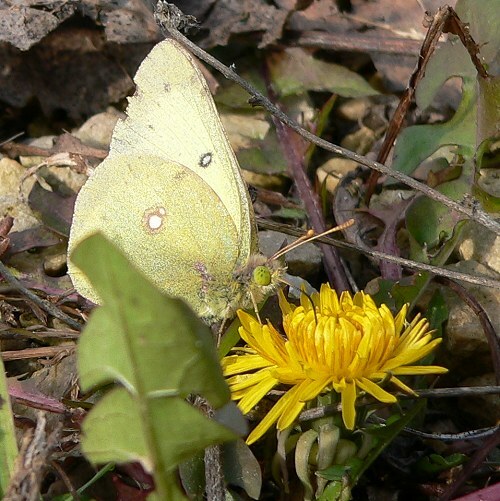 All the Sulphur Butterflies have yellow-green eyes. There aren’t many mushrooms now – it might be getting too cold. 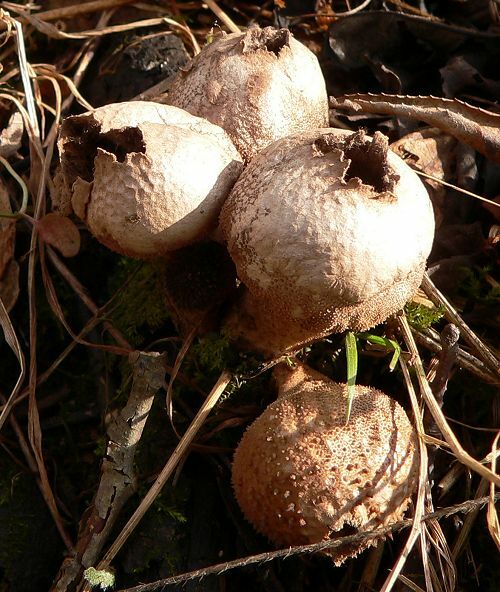 I did find some Puffballs – Lycoperdon sp. If you pinch them, they puff out clouds of dark spores. And there are still a few flowers blooming. 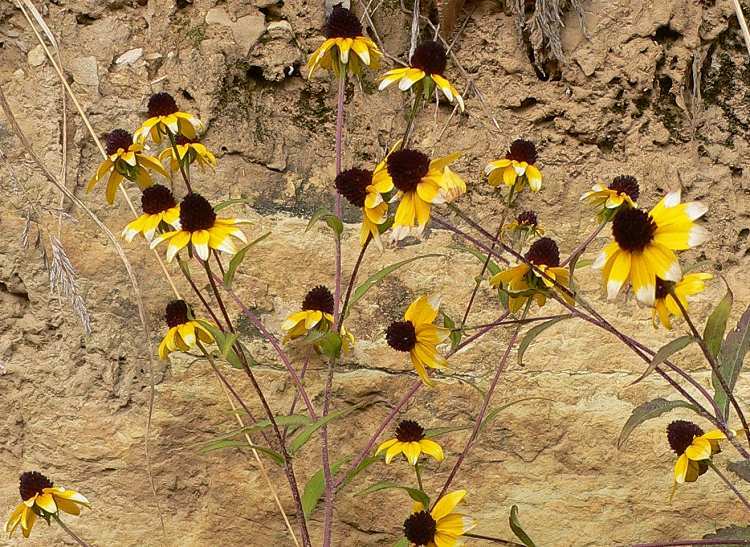 Here are some Brown-eyed Susans (Rudbeckia triloba) growing on the rocky cliff beside the garage. There are still flocks of migrating Robins in the woods. One evening, before dusk, we watched groups of Robins flying north, straight over the house. They were in small flocks – 6 to 15 in a group – and we saw at least a couple hundred birds in all. I’d like to follow them to see if they are roosting together somewhere, but the roost may be difficult to find unless the it’s actually on our land. 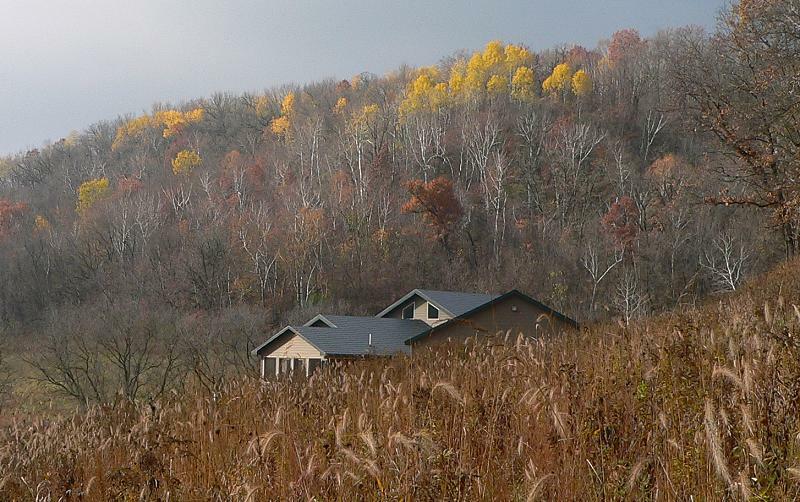 Here’s our house in the autumn landscape. I finished spraying the wetland area that I’m going to plant this winter – I always miss places the first time I spray, so I went back and finished it off. Most of it is looking nice and brown. I also finished cleaning all the prairie seeds for this winter’s planting. (I still have some wetland seeds to do.) Here are my seed shelves and the area where I do the cleaning. I feel very proud of those full shelves! The plastic bins on the right are full of “chaff” – the waste from the cleaning process. There are a lot of seeds mixed in, so I’ll put them out in one of the prairies after the migrating birds have moved through. 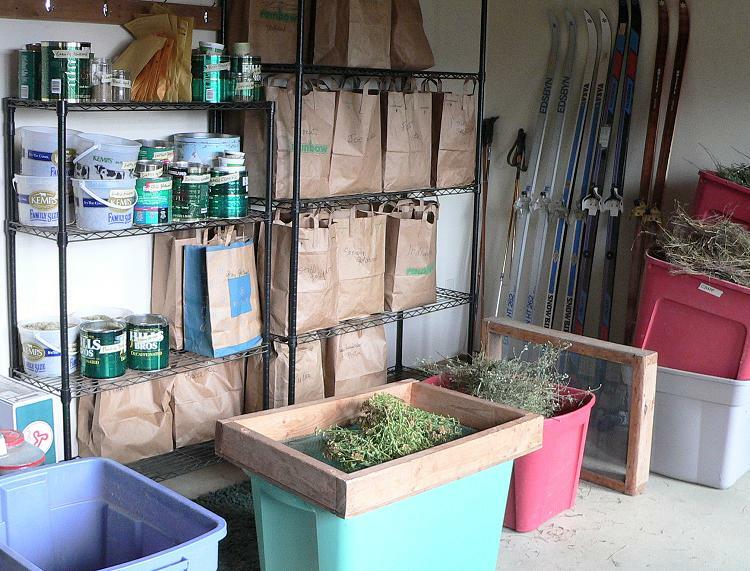 The bins on the floor in front of the shelves are the ones I use for cleaning the seeds. Usually I rub the plant tops over a screen. The seeds fall through the screen into the bin, the plant pieces mostly stay on top.